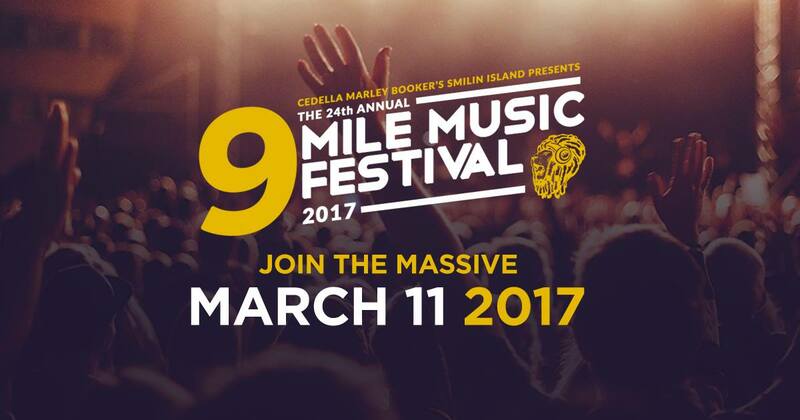 The law firm of Santucci Priore, P.L., which represents the owners and operators of the 9 Mile Music Festival, including Bob Marley’s brother Richard Booker and Cedella Marley Booker’s “Smilin’ Island” food brand, is giving away TWO General Admission tickets to the 9 Mile Music Festival in Miami on March 11th, 2017. This giveaway will benefit Florida breast cancer charity Save the Twinz: Live Pink! One winner will be randomly chosen and will receive both tickets/passes which will be valid for General Admission entry on the day of the festival in Miami. The law firm of Santucci Priore, P.L. is a Florida based law firm which practices in the areas of immigration law, business law, entertainment law, trademark law, patent and copyright registration, protection, licensing and litigation. Our principal office is located 200 South Andrews Avenue, Suite 100, Fort Lauderdale, Florida 33301. For more information about Santucci Priore, P.L., contact us online or call 954-351-7474. I LOVE REGGAE MUSIC. THIS YEAR MY MIDDLE SON IS GRADUATING COLLEGE. 9 MILE MUSIC FESTIVAL TO CELEBRATE. I feel that I should win because it would be a surprise gift for my husband. He owns his own business and works very hard to provide for myself and our 3 children. He never really treats himself either because he doesn’t have the time or we don’t have the money at that time. He went to the Nine Mile music festival once, years ago and he always talks about what a great time he had and I would love to experience that with him. My husband left me last weekend and we had plans to go to this festival together I’d like to win so that I can pick myself up a little bit during this trying time in my life. I SHOULD WIN BECAUSE I LOVE 9 MILE MUSIC FESTIVAL!!!! I want to win these tickets so I can surprise my girl that doesn’t ever take anytime to herself but keeps everyone else on track. Even if I dont win, I promise to check her twinz!